The science of Paleoclimatology is getting stronger with each passing year mainly through the study of ice core samples correlating how much carbon was in the atmosphere with planetary average temperatures in the distant past. Climate models have also been getting more sophisticated, which can not only forecast well into the future given carbon concentrations, but also simulate past natural variations. Last week it was announced that one model has simulated climate variability as far back as three million years ago, which bodes very well for any future predictions, cementing warnings for the future. 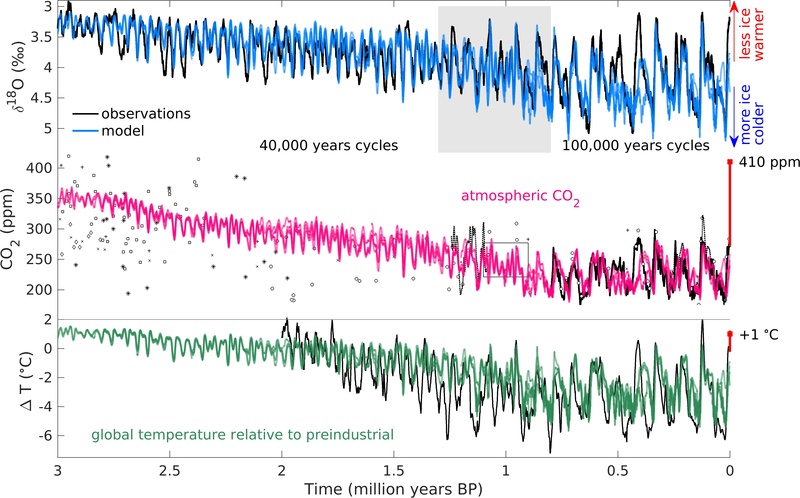 As discussed over the weekend from Dr. Jeff Master’s post their are logical reasons why at the end of this century if CO2 emission trends continue and are not curtailed, planetary average temperatures will get over +3.0C above preindustrial conditions. This new model simulation only confirms that conclusion. Heed these earnings. Period. Here is some more climate and weather news from Monday later today.